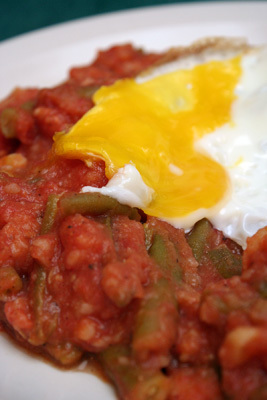 When this recipe invited me to top each serving with a fried egg, I was ready to try it. The “Stewed Potatoes and Green Beans with Tomatoes,” from the November 2009 issue of Gourmet, was rich and flavorful, though simple. I’ve always enjoyed this taste trio -- potatoes, green beans, tomatoes -- it’s been with me since my childhood. These flavors will be inspirational to you. You’ll eat and think, “Stew?” I challenge you to add beef and noodles to this stew foundation, and see what happens. I seasoned with 1 1/2 tsp. salt and 1/2 tsp. black pepper. The fried egg on top made this dish a crowd-pleaser, for young and old. Do you really need a recipe for this dish? Well, no. Enjoy it for what it is: real simple food. Next time, I’ll delve into the December 2009 issue of Everyday Food, and make “Turkey Cutlets with Rosemary and Shallots” (recipe below), along with the “Barley Pilaf.” Return to my site on Friday, June 11, to witness my meal. One at a time, place turkey cutlets between two sheets plastic wrap. Using a meat mallet or heavy skillet, pound cutlets to a 1/4-inch thickness. In a large skillet, heat 1 tablespoon oil over medium-high heat. Season turkey with salt and pepper. In batches, cook turkey until cooked through (add up to 1 Tbsp. oil if needed, reducing heat to medium if skillet becomes too dark). Transfer turkey to a plate. Add 1 Tbsp. oil and shallots to skillet; season with salt and pepper. Cook, stirring occasionally, until shallots begin to soften, about 4 minutes. Add wine and rosemary and cook until syrupy, about 3 minutes. Add broth and cook until reduced by half, about 2 minutes. Return turkey to skillet and cook until warmed through, about 1 minute. Remove from heat and stir in butter; season with salt and pepper.